Just this week I was in a conversation with someone and I found myself saying “Hey The Amp Hour interviewed someone in that field!” only kill the flow of the conversation with Google searching for the episode. Turns out it was Episode 71 with John Edmond of Cree. I started listening to The Amp Hour way back when the number of episodes could be counted your fingers in decimal, not binary. Since then I remember the gist of a lot of shows but I haven’t gone back and replayed too many which is a shame since Chris and Dave have done a lot of really cool interviews as the show has grown. After that conversation I figured if I can go back and reread books at any point why not do the same with podcasts? So that’s my aim for the short-term, re-listen to some of the interviews that have stuck with me over the years. It will shock no one that a lot, but not all, of them are analog focused. #187 – An Interview with Elecia White – Wirewove Worshipping Wookieist? Assuming I’m doing routine tasks at work that don’t require me to be in full on troubleshooting mode I should be able to keep occupied for a few weeks at least. If anyone can think of a good interview I forgot or just wants to share their favorite interview with me I’ll be happy to add it to the list! Also, I’d like to somehow bundle all these files into one convenient download for whoever wants them but I don’t know how to go about doing that easily unfortunately. Please clue me in if you could be so kind. Update: Dave pointed out to me that I could always just use The Amp Hour App to easily find the shows I’m looking for. Doh! I’d forgotten all about that. Check it out and support the show! 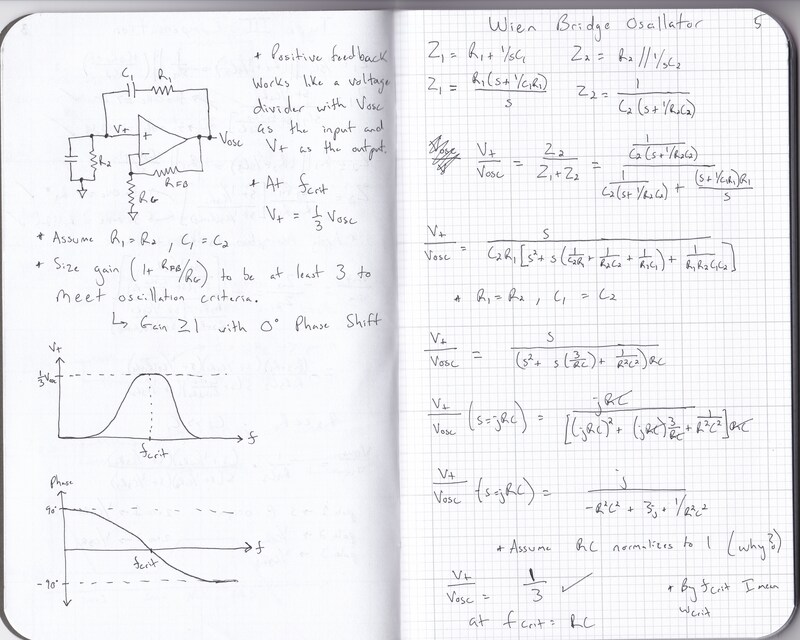 For my second Circuit Notes entry I decided to go with the Wien Bridge Oscillator. This time around the math wasn’t as intensive as it was for the Type III compensation with one exception. I had originally got the right answer in my derivation but had made a math error in the final step that I caught while writing in my Field Notes book. When I corrected the mistake I no longer knew how to make the math work out to give the correct output voltage at the resonant frequency. Wikipedia helped some by claiming RC was normalized to 1 but didn’t state why and I still don’t know. Is it just to make the math easier or is there a deeper reason for doing so? Maybe college me could figure it out but present me is a tad rusty and so that last step is left as an exercise to the readers. I’ll keep digging and post an update if I find it or someone can correct me. Either way, the Evernote link can be found here and if you have any recommendations for a circuit you’d like to see analyzed feel free to send them my way. The other week I impulse bought a bunch of Field Notes notebooks under the justification that they were a birthday gift to myself. I’ve been carrying a small pocket notebook on me for at least a year now so the regulator sized Field Notes won’t be stuffed in a drawer somewhere and forgotten but I also broke down and ordered a pack of the new limited release Arts & Sciences books too and needed a good use for them. They’re beautiful notebooks and I definitely recommend picking up a pack or two while you still can. After brainstorming a bit I got the idea of using them to compose a circuit reference for myself. I seem to find my self deriving the same formulas over and over again at work so putting them all in one place where I can easily look back on them made the most sense. In order to keep this site from stagnating I figured I may as well also share them with whoever wants them. 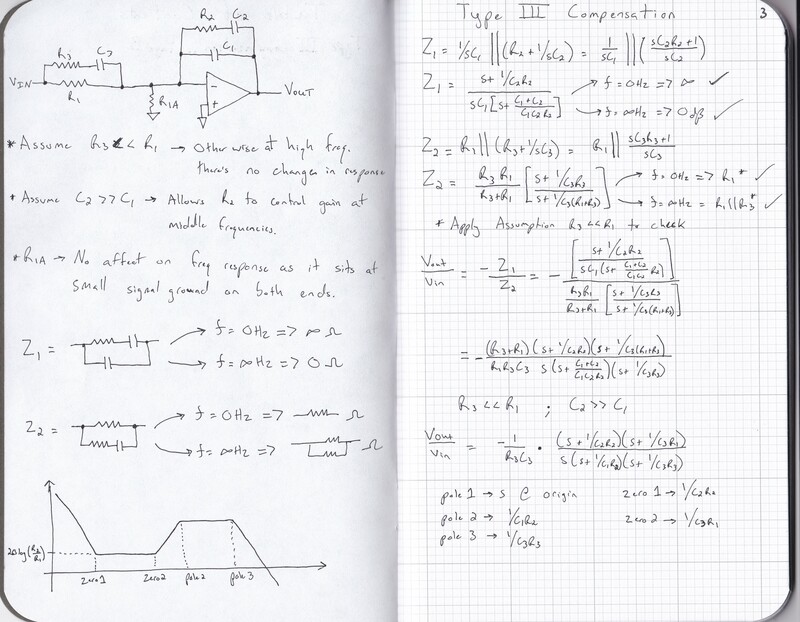 The Arts and Sciences books are the perfect size (7.5″ x 4.5″) and layout to fit a schematic on the blank left page and the derivation with some notes on the grid/lined right page. As an added bonus, writing out the circuits by hand with the idea of needing the info later will, ideally, help me to improve my normally atrocious penmanship as I have to take my time and focus on my writing. Without further ado, here’s the Table of Contents and first entry into what I’m calling my Circuit Notes Series. I went with the transfer function for Type III compensation for switching regulators. 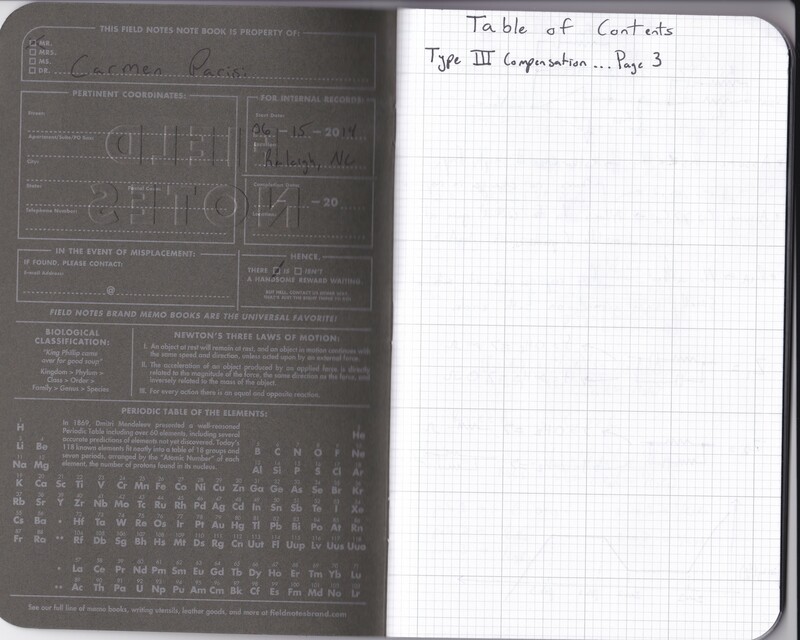 Checkout the cool reference tables Field Notes threw on the inside cover too. Since this is just a reference I didn’t include all the math or in-depth details of how the circuit works, just some key notes to keep in mind. Think of this as an introduction to the circuit, not a be all end all treatise. For anyone who would like to save a digital copy of these derivations I’ve also posted these pages to Evernote (here and here) where you can add them to your own notebooks and search them using OCR. Hopefully someone finds these notes as useful as I do! The next note I do will be on an RC oscillator circuit and after that who knows? Recommendations for circuits are welcome too as I’m always willing to learn some new topology. So Monday at work I successfully pulled a prank on the designer for the part that is currently occupying the majority of my time. Concept, planning, and execution took about two weeks or so as I had to fit this little side project in around my real work obviously. Ever since the part’s inception this designer had been claiming it was perfectly designed and any errors were clearly the fault of me, the Applications Engineer. He wasn’t being mean or anything, this sort of good-natured rivalry is pretty common between the Apps and Design departments at work, but being that this is my first part as lead apps since starting a year ago meant I got some extra abuse. I figured it would be a good idea to go on the offensive and show everyone I wasn’t such an easy target. My boss, who’s been good friends with the designer for a long time now, thought it would be pretty funny and approved the gag, eager to see how it would play out. Without diving down the rabbit hole that is regulator compensation, the comp pin of any buck converter is the output of an error amplifier which connects to a networks of passives going back to its negative terminal (the Feedback pin) and is part of the control loop used to keep the output voltage stable and well-regulated. My circuit would periodically drive this pin away from its steady state operating point. This disturbance would propagate through the chip and result in a noticeable glitch on the output voltage until the compensation loop could regain control and bring the output voltage back into spec. As phase switches merrily along at the frequency and duty cycle set by the controller it gets divided down by R1 and R2. When phase is high the output of this voltage divider is enough to forward bias the diode and cause current to flow into C1 for a brief period before going low again. C1, which also connects to the positive input comparator U1, charges over time and when the voltage across the cap gets to be higher than the reference voltage present on the comparator’s negative input the comparator’s output swings to 5V. When U1’s output goes high two things happen. One, comp is driven away from steady state through R5 and two, the gate of M1 goes high which discharges C1 below the reference voltage starting the cycle over again. There really wasn’t much thought process behind the component values in my circuit; they were determined through trial and error in simulation. I didn’t care how often the circuit would trigger, only that it did and the disturbances it caused would appear on Vout. One of my only goals was to ensure that the resistor dividers wouldn’t draw enough current to interfere with the normal operation of the regulator and cause it not to start up. My second goal was to “break” the regulator just enough to cause concern but not enough to trigger any of various over voltage, current, or temperature protections built into the chip. This is why R5 had to be added; without it comp was driven too hard and the part simply shutdown (there’s no fun in that). With the circuit idea solidified I headed into the lab to jury rig it into place underneath one of the eval boards. It was a messy hour after work one day, but I successfully placed each component and wired in the various signals and voltages from all across the board. Once things got going, there would be so many cables and probes attached to the board I knew it wouldn’t get turned over until I was ready to reveal what I’d done. Holding my breath I powered up the board after making all the necessary modifications. Surprisingly enough it worked! 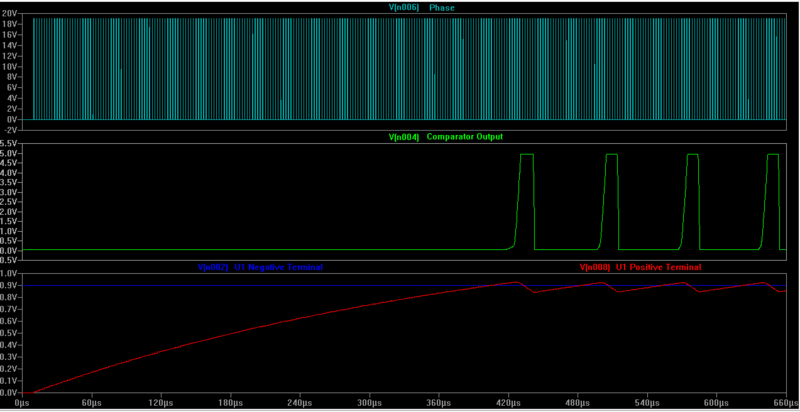 I hadn’t made any disastrous mistakes when wiring it all up and the resulting waveforms basically match with my sims. All that was needed was some tweaking of R5 to find the right value and I was ready for action. Cutting to Monday morning, I spent a little time taking scope captures of a good board and my doctored eval board. These were placed in a quick report which I shot off to my boss and the designer right after lunch. To add to the joke I took my clean scope caps using a part from an old rev of silicon and explained how the “bug” was only seen in the latest version of the chip. This caused the initial spark of concern in the designer as we’re currently waiting on a new rev of the chip to arrive from the fab and it was too late to make any changes. After getting some tests to run and tweaks to try, I actually went into the lab and did them! For one I was curious to see if any of them could actually fix the error (they didn’t) and secondly, this designer is pretty hands on and likes to come out to Apps Lab quite often. I knew that if he came out to see the glitch on the bench and none of his changes were made he would get suspicious. Fortunately, or unfortunately, other obligations kept him away for the day and he never came out to see the problem until the end of the day. After running the initial list of tests the designer gave me I had a flash of brilliance that really threw him for a loop. I took a series of scope shots at each of the four switching frequencies our part could run at and varied the value of R5 at each one. Now I had created a problem that went away as switching frequency increased and could explain why we hadn’t seen this issue before as the majority of our testing had taken place at high frequency up until this point! Bingo. By the end of the day, the designer was pretty much stumped. He’d done an initial check of his schematics, couldn’t spot an obviously fault he made, but thought it was a mistake somewhere in the core of the modulator. He told me that at this point he essentially resigned himself to hoping the new version of the chip came out okay and whatever changes he made would happen to fix this (remember it’s too late to make changes now as the part’s being fabricated). Right afterwards I called him into the lab saying I’d found something interesting and he should come take a look. When I showed him the circuit on back of the board he didn’t get it at first. He asked why all this crap was added and what did it fix? I couldn’t hold back anymore and broke out in a smile and said that I just wanted to mess with him. Slowly realization dawned on him and he started laughing as did my boss and a few other guys in the lab who were in on the joke. In the end the designer took it really well and thought it was pretty funny. He told my boss to give me more work as clearly I didn’t have enough to do since I could pull these elaborate pranks but mostly he just laughed. I now owe him a round or two the next time a bunch of us go out after work but that’s a price I’m more than willing to pay all things considered. In the end I caused him just enough trouble so he started to sweat but not enough to take him away from any real tasks he had to get done. A well executed prank overall in my opinion. Surely, there’s no way this will every come back to haunt me right? Not too long ago I was reading through one of Jim Williams’ famous App Notes, AN13, High Speed Comparator Techniques. It’s an older App Note that was published back in 1985 and I didn’t really have a specific reason for reading it other than thinking it looked interesting and I wanted to learn more about comparators. For a comprehensive overview of AN13 I recommend reading Dr. Lundberg’s (aka Dr. Analog) three part summary over on his blog Reading Jim Williams. The first section of AN13 is extremely informative and makes the app note well worth the read in my opinion. Entitled “The Rouges Gallery of High Speed Comparator Problems” this portion of the app note highlights common pitfalls of comparator circuits including bypassing, ground planes, probe compensation, and much more. As useful as The Rouges Gallery is what intrigues me the most in AN13 doesn’t actually have anything to do with comparators and is found in the first circuit of the Applications Section. 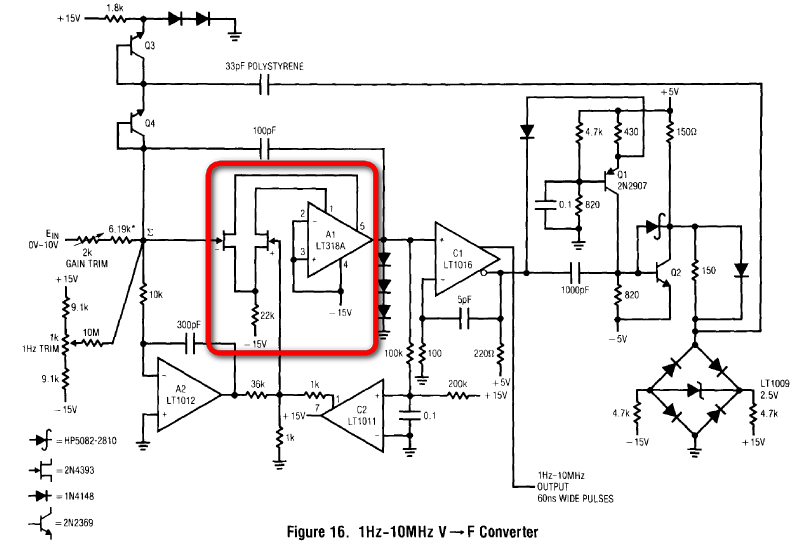 The overall circuit is a Voltage to Frequency Converter shown in Figure 16 of AN13 and reproduced below with the part that fascinates me most boxed in red. What Jim Williams has done is replace the input stage of A1, the LT318A, with a pair of 2N4393 JFETs. These JFETs drive the output stage of A1 via the two Comp pins of the amplifier. A1’s true inputs are shutdown by shorting them directly to the -15V supply leaving the rest of the amplifier free to serve Williams’ needs for this particular application. According to page 8 of the app note this trick was done “for low bias, high-speed operation.” Now I don’t have a whole lot of experience using op amps with Comp pins to begin with let alone understand their internal architecture enough to hack them like Jim did. As far as I knew something like this wasn’t even possible and it definitely wasn’t brought up in any of the classes I took in school! Needless to say, upon seeing it done here in AN13 I was a little stunned. After my initial shock I decided to look at the LT318A a little more closely to try to see how Jim Williams had pulled off this neat little trick. Linear Tech is usually pretty good about providing schematics of their op amps with a description in their datasheets and I was hoping this was the case with the 318. 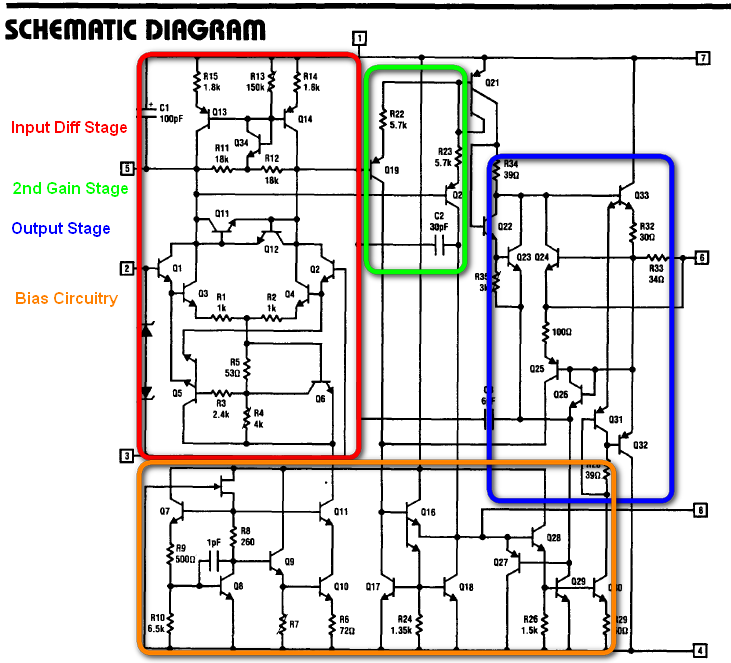 As it turns out, the LT318A datasheet is a bit sparse compared to other datasheets from Linear but fortunately for me it does contain a schematic of the part. Unfortunately for me, it doesn’t appear to be a simplified version and there isn’t a functional description. Looking at the schematic in detail I could tell this wasn’t the basic op-amp architecture I was used to dealing with but I decided to dive in anyways. I’ve copied the LT318A schematic here and marked it up into functional blocks as best as I’m able to but if anyone out there has more info on this op amp or sees somewhere that I went wrong please let me know. 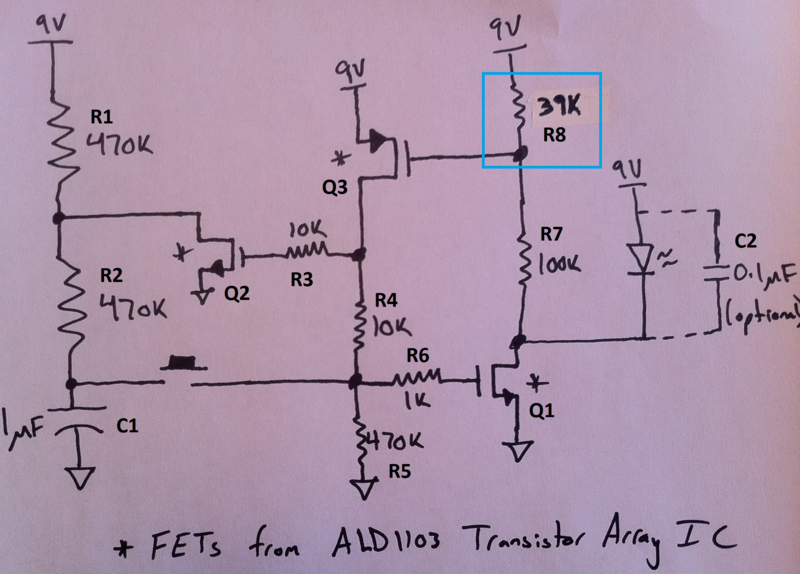 From studying the datasheet schematic of the LT318A I was able to understand more of how Jim’s op amp hack works. Connecting the amps inputs on pins 2 and 3 to the negative rail turns off the differential amplifier, the heart of which are the input transistors Q1-Q4 with Q13 and Q14 being the active loads. As a side note there may be some common-mode feedback on the diff pair but I’m not 100% sure. Thinking about what was said in the app note I would have to assume using two JFETs in place of the input circuit on the op amp would lower bias requirements and cutting out all those transistors speeds up operation of the overall application circuit. The output from the input differential stage is then fed into what I assume to be a second gain stage (not sure what Q21 does, this may be a weird folded cascode configuration too). From Figure 16 in AN13, you can see that Jim Williams has the JFET input transistors driving pins 1 and 5 on the LT318A. Sure enough these two pins correspond to the output of the diff pair on the amplifier and feed directly into the second gain stage. Following the gain stage comes what appears to be a Class AB output stage. Any neat op amp hacks of your own? See a mistake in my analysis of the LT318A? Let me know in the comments. Oh, and Happy New Year! So I spent the other weekend in Washington, D.C. visiting a friend for his birthday. While I was waiting for my plane to take off in RDU Alan over at Tektronix was kind enough to provide me with some pre-flight entertainment. Back in 1987, Alan assembled The Ultimate Analog Engineer’s Toolkit designed to provide solace to engineers dealing with such problems as noise, the Miller Effect, and management, among other things. My personal favorites were the box of dBs (positive and negative flavors of course) and the Parasitic Pesticide. I tried to order some samples directly from Alan himself but he said his stock has run dry. I hope he can get another shipment delivered in time for the holiday season. Anyways, as I was sitting in the terminal after reading it and I started to come up with a few additions to the toolkit and I present them to you here. The Low Flow Current Adapter – We’re all familiar with the low flow shower heads installed in bathrooms nationwide to reduce water consumption. The Low Flow Current Adapter works in much the same way only on current instead of H2O. Plug this bad boy in between the power source and your circuit and watch as your product’s power consumption plummets before your very eyes. Frequency Shaper Tool – Sometimes designs run over budget and when this happens you can’t always afford the box of high quality dBs needed to make a circuit meet the required specs placing a lot of “hertz” on you the designer. This is where the patented Frequency Shaper Tool comes in handy. While not as precise as a Box of dBs its low cost and reliable performance makes it ideal for the engineer on a budget. The Shaper allows a designer to grab a hold of an amplifier or filter’s frequency response and bend it to the desired shape. Need to nudge a zero in the stop band? Squeeze just a little more rolloff out of a filter? Reach for the Frequency Shaper and bend a transfer function into submission. DocuGel – Come across an old PCB, product, or IC and have no idea what it does or how to use it? Did someone who’s clearly not as bright as you are forget to document their work and now the burden to upgrade the device is on you? Spread some DocuGel on the offending product and leave it sit overnight on your bench. Return the next morning and find datasheets, BOMs, gerber files, and schematics laying on your bench! Grounding Stakes- Nasty PCB layout causing you problems? Is your circuit’s performance suffering at the hands of ground refusing to sit at 0V? Pound a ground stake into an open portion of your board and watch your problems disappear. 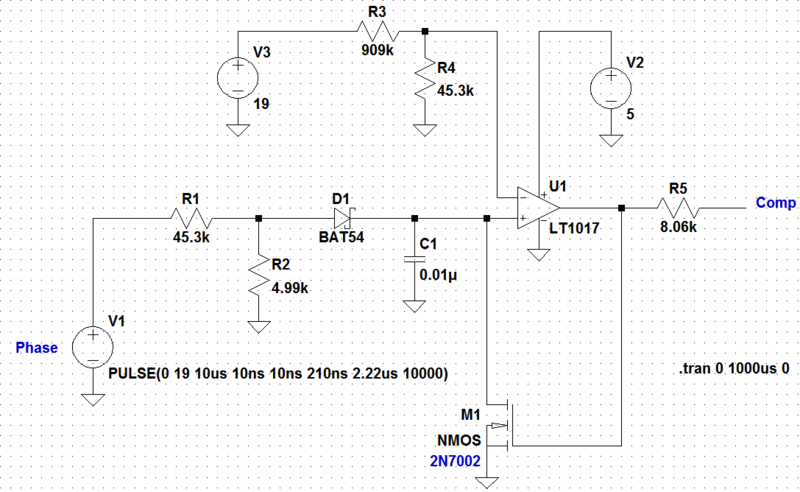 Let your circuit know you only accept 0V, no more, no less. This journey began back in Part 1 with me discussing the theory behind the transistor latch used by Dino at Hack a Week back in August. Next it progressed to recreating Dino’s circuit using components I had on hand in Part 2. Originally, the circuit I built didn’t work at all and I was able to narrow the problem down to leakage current in the base of the transistors. Knowing what I was up against finally, our story concludes as I set out to improve upon the latching circuit. Figure 3 shows my first method of improving the transistor latch, losing the BJTs all together. Since the 2N3904s and 2N3906s were drawing too much leakage current in the first place and setting off the latch randomly I decide they had to go. What type of transistor could I use instead of a BJT that draws little to no leakage current? Why a MOSFET of course. The gate leakage current of the only FETs I had on hand, the ALD1103 transistor array, was spec’d between 1 and 50pA, orders of magnitude less than the BJTs used before. Surely such a small current wouldn’t cause the latch to turn on when it wasn’t supposed to. After breadboarding the revised circuit using the ALD1103 I found that the circuit was much more consistent in its operation. The only real changes to the circuit I had to make were the addition of bypass caps on the supply (not shown above, sorry) and tweaking the value of R8 (boxed in blue above) to 39kΩ. While the latch worked well enough keeping R8 at 1MΩ I found that lowering its value caused many less false triggers. Now that I had a functioning latch finally I decided to challenge myself. I wanted to see if I could go back and make a working latch using the “inferior” BJTs. There were a few ideas floating around in my head on how to go about doing such a thing and Figure 4 below gives my best solution. Since the base leakage current from Q3 through the 1MΩ resistor was causing most, if not all, of my problems the first time around my focus was now to minimize the effect that leakage could have on the overall operation of the circuit. Looking at Figure 4, one can see that R8 has been replaced with a fourth BJT. Q3 and Q4 (boxed in orange above) form what’s called a simple current mirror (or current source depending on how you want to look at things but I digress) with Q4 configured as a diode connected transistor. Note that when adding the simple current mirror to the latch the diode connected transistor MUST be located where Q4 is in the circuit. With the diode connection Q4 acts like a standard diode with its anode at 9V meaning that at least in this application, it always looks forward biased. Diode connecting Q3 instead gives a constant path for current to flow from 9V to ground (via diode connected Q3, R4, and R5) and so the circuit will never turn off. In an IC this would mean that a start up circuit would be unnecessary (typically a good thing) but in the case of the latch that’s exactly the opposite of what we want. 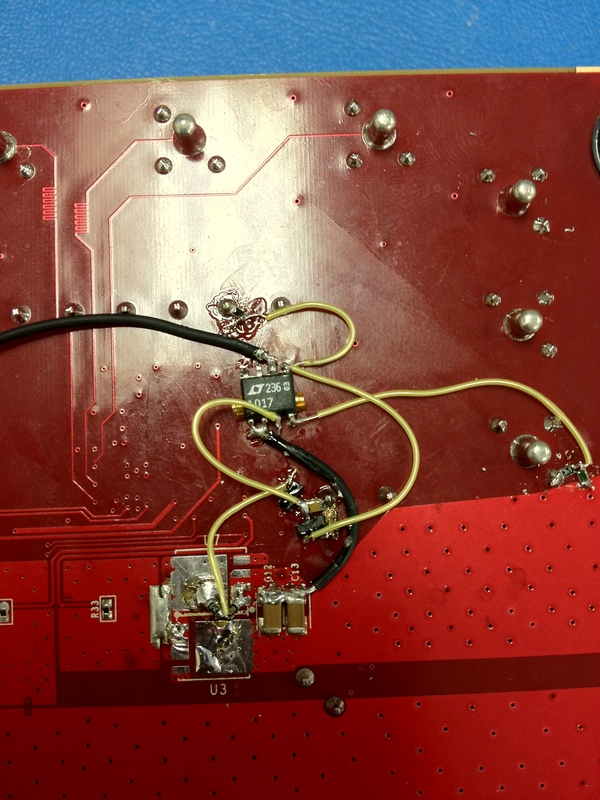 Placing the diode connection on Q4 means that even though it looks forward biased, current doesn’t flow through that branch of the bias network since the collector of Q1 would float high as Q1 itself is turned off. Powering up this new circuit showed great improvement over my previous attempts to build a latch using BJTs. Most of the time the latch was only triggering when I toggled the pushbutton. With the main leakage problem taken care of I then began to look at Q1. Ignoring R6 for a moment, Q1 looked an awful lot like how Q3 was configured with the 1MΩ resistor back in Figure 1 which had me thinking about leakage through this transistor. Reducing the resistance of R5 down to 56kΩ (via trial and error) further improved the circuit’s reliability and I hardly ever saw a false trigger when testing the circuit. I briefly toyed with the idea of adding a current mirror to the bottom half of the bias network which would remove R5 and R6 and add a fifth transistor but decided against it as I wasn’t quite sure if I could maintain reliable operation by doing so. Instead, I called it a day, happy that I had successfully challenged myself to build a better circuit. As a final helpful hint to anyone looking to build this circuit, pay careful attention to how you layout the latch on your breadboard. Keep your jumpers wires and component leads as short as possible to avoid accidental shorts and reduce any coupling between nodes that may take place. Even though my improved designs functioned much better than the original they still were sensitive to disturbances on their nodes. While testing the circuit in Figure 4 I rarely, if ever, experienced false triggers when simply pressing the pushbutton after I applied power but probing a node with my multimeter would often be enough to trip the latch and have it turn on. Other than that, good luck!